"I am concerned for the security of our great Nation; not so much because of any treat from without, but because of the insidious forces working from within." The history of South Sudan is complex and intriguing. The problems that plagued the region at the time were a result of internal disputes between the British Southern Policy and the Arab elites of Sudan. 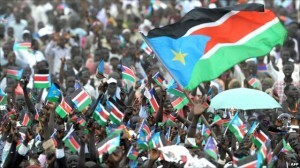 The British Southern Policy applied the '' Divide and Rule '' tactic in Southern Sudan. The Southern Sudan region became a closed district to the outside world and the Southern Sudanese were encouraged to practice their native languages and customs while British customs and religions were imposed upon them. Within these closed district, only missionaries and British officials had access to the natives. The natives were tightly guarded from the Arabization of Northern Sudan. The British had much disgust for the Islamic faith and practices; usually, wherever the British conquered, Christianity and European way of life was left behind. In the end, the British and the Arab of Sudan struggled for power to control the African Sudanese. The Arab Sudanese are Africans who desperately attempt to identify themselves to the Arabian people and Empire. They reject their African origins and have tried everything to erase their African identity. They see themselves as inferior to the British and Arab peoples and Empires.The Arab Sudanese is a black man who hates himself. They have for long now fought their inferiority complex by demonizing Nilotes. The Nilotes of Sudan occupied the Southern region of Sudan at the time of the colonies. The British saw the African as racially, culturally, and intellectually inferior to them and the policy they imposed in Southern Sudan validated these racist attitudes. The British dealt with the African Sudanese without empathy or interest. The British saw work as the only purpose of the African person! Though Arab Sudanese are of African and middle-eastern Arab descent ashamed to be African, they were embarrassed of the perception the British had about the Southern Sudanese natives. So they glorified and worshiped their Arab roots and discarded their African roots. Hence, to the British, they also felt inferior. The British made sure the Arab Sudanese had no contact with the Southern Sudanese. The Arab Sudanese wanted to racially, religiously, politically and culturally influence the Southern region of Sudan and establish a whole united Sudan without British influence and governance. There were many opportunities in the South in terms of commercial trade and labor but the British couldn't tolerate the Arabization of the Southern region of Sudan. The closed district of the Southern Policy benefited the British empire as it sheltered the Southern Sudanese natives with access reserved to the British. The Southern Sudanese people at the time were used as slaves. Hard working and strong slaves were needed and the African Sudanese fit the description. The Southern Sudanese people were perceived as inherently slaves by the Arab Sudanese and the British.